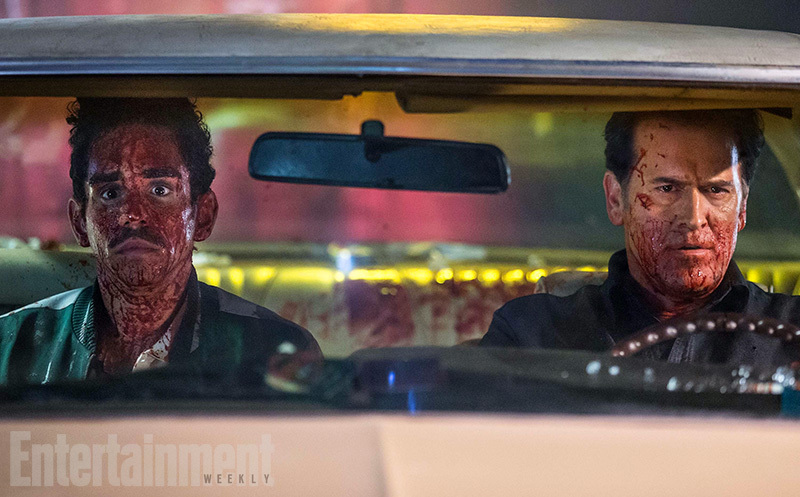 I was both excited and wary when I heard that a TV series based on the classic Evil Dead films was to be released. 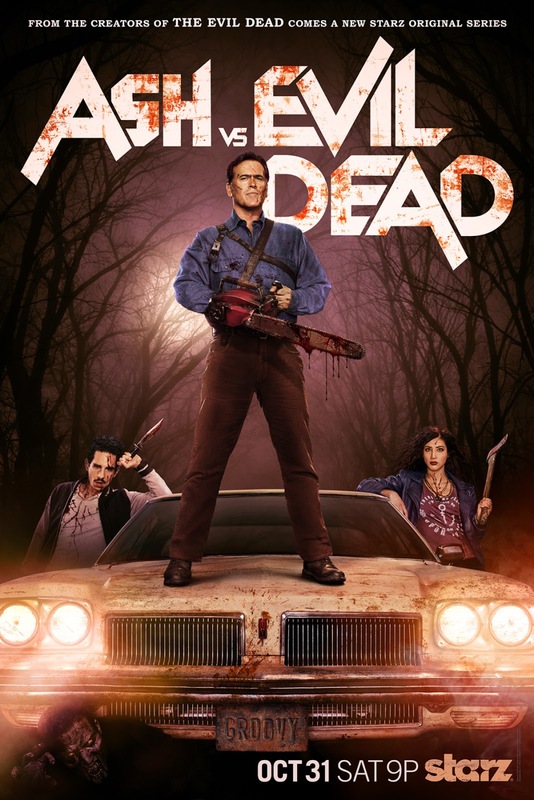 Of course it was beyond amazing that horror icon Bruce Campbell was to be starring, reprising his role as Ash, yet being so many years later I wondered if the show could be up to scratch and if the script would be right, let alone how gory it would be allowed to be. Amazingly Ash vs Evil Dead straddles the line between comedy and horror really well. In my opinion Army of Darkness went too far down the comedy route, the horror suffered being more censored. This show is more like a combination of that films humour with Evil Dead II's horror, both visceral and laugh out loud funny. Humour is the name of the game though so anyone hoping for the more series style of The Evil Dead may be put off. Talking of those films it was great to see audio and visual clips from the first two films in the trilogy inserted intelligently into the show, these always felt natural and really add to the mythos, such as when Ash first explains to Pablo his past that is shown via a semi screen flash back. Army of Darkness isn't referenced at all, I found this weird as time travel isn't a thing you would forget about, but it made sense once I realised they could not get the rights to use anything from that film, a shame but understandable. Is great to see Ash's evil hand return though it has to be said! Star of the show in every sense of the word is Bruce Campbell who excels in his role as the over confident, wise cracking heroic idiot. Characters who encounter Ash all seem to think of him as the fool he is, even his friends share glances at each other over some of what he says and does. The great thing about the character of Ash is just how accomplished he is despite his many short comings. He may say dumb things and be a self centred jerk but he gets the job done and Campbell is consistently hilarious making me laugh out loud on many occasions. The supporting cast slowly start to shine also. Pablo in particular is a close second in terms of humour, his character is lovable and some of what he comes out with is gold, such as when Ash is telling him that maybe his weapon of choice should be a broken bottle. While not having as many great lines Kelly is also another character I came to like, she is the straight one of the trio. By the end I was fearing for all these characters lives, so I cared about them. Of the other two I don't feel like Ruby had enough to her, Lawless was fine enough but was a bit of a blank slate, Amanda I eventually came to like but it was too little too late by then. You definitely notice when Ash is missing as it just isn't as engaging a show when he is out the picture. Each of the ten episodes follow a similar format, one that is stuck to pretty rigidly thanks to the criminally short run times. With the exception of the first and final episodes each one is roughly twenty five minutes in length which for a horror show just feels too short. At times it feels the flow is cut off mid storyline, best seen with Brujo that just appeared to abruptly end mid scene. Every time one of these shorter episodes finished I was left desperate for more. Saying that I cannot wait for this to be released on Blu-ray so I can watch the whole thing back to back. Each episode ended with a brief making of section, I didn't see most of these but the ones I did watch were interesting enough. Back to what I was originally saying though, the episodes follow a staple format, talking and action. Rather than be based in one location nearly every episode takes place in a completely new place. You get the supermarket Ash works in, the trailer park where he lives, then a whole bunch of locations the group find themselves in as they search for answers, all culminating in the iconic cabin from the Evil Dead films that was a joy to revisit. The conversations are comedy gold but the action scenes are also for the most part well done. Initially I was worried as some of the CGI on display here is terrible, an early fight Ash has with a doll looked rubbish quite frankly, luckily computer generated stuff seems kept to a minimum with mostly practical effects used. The violence of the action scenes never failed to impress, there is some damn gory parts here. People get impaled on deer antlers, they get sliced up and shot, one character gets a meat clever though their shoulder, another breaks their ankle to show a grim shot of the bone sticking through the flesh, and all that's just on the human side. The Deadites look great even if they come across as less scary than in the films. They still have super strength and goad with their comments, and still have to be dismembered to truly stop. Some of the effects are really special, there are a few of Ash attaching his chainsaw hand mid leap that I loved, and a later one of him shot gunning a child demons head off was pretty cool. By the end there is gallons of blood being thrown around, awesome stuff. This all leads up to a thrilling finale that incorporates a lot of the classic Evil Dead style shots, that of crazy angles and camera changes signified by sound effects, as well as the classic P.O.V of the arriving evil charging through woodland. This was all great up until the very end of the show which I hate to say was actually quite disappointing. Ash does stuff that felt out of character considering the journey he had been on, it was such a jarring shift that right until the end of the final credits I was sat there in dumb silence expecting a reveal that the ending shown wasn't what had really happened, maybe something along the lines of Army of Darkness's twin endings, but no that was indeed it. With a second season announced hopefully that will make up for the silly finish which did tarnish what was up to that point bordering on perfect at times. Despite some bad plot decisions, the lack of depth for any but the main cast, and some dodgy CGI Ash vs Evil Dead is essential viewing for any horror fan. This is frequently hilarious with some great sequences and a perfect blend of the new and old style of the Evil Deads. I am not only counting down the days till I can own this for myself, but also for the beginning of season two which I have no doubt will at the very least continue to be full of over the top violence and a genius script.